A good fare to the capital of Indonesia. Use the trip as a springboard to visit Bali and Borneo. 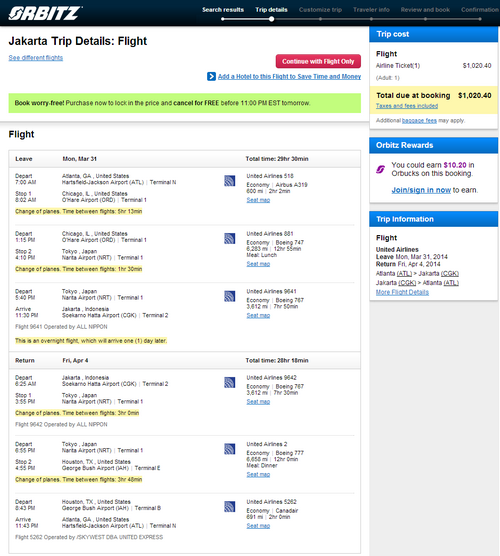 Low cost carrier options include AirAsia, Lion Air, Citilink and JetStar. Valid for travel on the outbound from March 30th – May 15th, 2014. Must purchase by February 27th, 2014. ATL – ORD (Chicago) – NRT (Tokyo) – CGK (Jakarta) – NRT – DEN (Denver) – ATL. 21,082 miles or 4.9 cents per mile. Some flights may be operated by All Nippon Airways, which is a member of the Star Alliance and a United partner. This fare will earn 100% mileage with United.